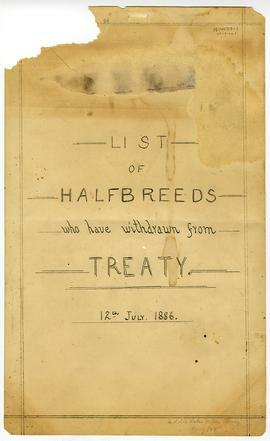 Itemiw-glen-845 - "List of Halfbreeds who have withdrawn from Treaty"
Itemiw-glen-846 - "List of Halfbreeds who have withdrawn from Treaty"
The responsibility for Indian affairs in Canada has rested with the British Government, various colonial administrations and, since Confederation, with several branches and departments of the federal government. The Department of Indian Affairs and its predecessors have been responsible for such matters as treaties, reserves, provision of education, and supervision of agriculture on reserves. For a detailed administrative history, see Records Relating to Indian Affairs (RG 10) / Peter Gillis et al. - Ottawa : Public Archives of Canada, 1975. The Hobbema Indian Agency, situated at Pigeon Lake and Hobbema near Wetaskiwin, Alberta in the Treaty 6 region, consisted of Cree reserves including Ermineskin, Samson, Pigeon Lake, Montana and Louis Bull. Hobbema was a sub-agency of the Edmonton Indian Agency until 1885 when it became a separate agency. Indian agents have included M.G. Dickieson (1879), James G. Stewart (1880), W. Anderson (1881-1883, 1885-1887), S.B. Lucas (1883-1885), W.C. de Balinhard (1888-1889), Charles de Cazes (1890-1892), D.L. Clink (1893-1896), W.S. Grant (1897-1905), G.G. Mann (1906-1913), Joseph Butlin (1914-1921), C.W. Kirby (1922-1923), Wallace Graham Askey (1924-1931), Col. R.H. Palmer (1932-1936), A.G.B. Lewis (1938-1945), and W.P.B. Pugh (1946-1947). The responsibility for Indian affairs in Canada has rested with the British Government, various colonial administrations and, since Confederation, with several branches and departments of the federal government. The Department of Indian Affairs and its predecessors have been responsible for such matters as treaties, reserves, provision of education, and supervision of agriculture on reserves. For a detailed administrative history see Records Relating to Indian Affairs (RG 10) / by Peter Gillis et al. - Ottawa : Public Archives of Canada, 1975. Treaty 4, the Qu'Appelle Treaty, was signed in 1874 by Cree and Saulteaux in 195,000 square kilometres in part of western Manitoba and most of southern Saskatchewan. Treaty 6, the Fort Carlton and Fort Pitt Treaty, was signed in 1876 by Plains and Woodland Cree in 312,000 square kilometres of central Saskatchewan and Alberta. Treaty 7, the Blackfoot Treaty, was signed in 1877 by Blackfoot (Siksika), Blood, Peigan, Sarcee (Tsuu T'ina) and Stoney in 130,000 square kilometres of southern Alberta and a corner of southwestern Saskatchewan. Under the provisions of these treaties, an annual payment was to be made at the rate of $25 to each chief, $15 to up to four councillors per band, and $5 to every other Indian man, woman, and child. The fonds consists of official diaries (1903-1907, 1929-1945, 1949); letter register books (1885-1887, 1891-1894, 1902-1912); lists of Metis who withdrew from treaty in Western Canada (1886-1892); Pigeon Lake annuity pay list (1927); invoices, receipts and record books regarding supplies, beef sales and slaughter, grist and saw mill; daily issue books; cashbooks; medical reports; and correspondence regarding industrial schools. Gift of Hobbema Indian Agency, 1957-1960. Other Hobbema Indian Agency records are held by National Archives. Microfilm copies of some of these records are available at Glenbow.